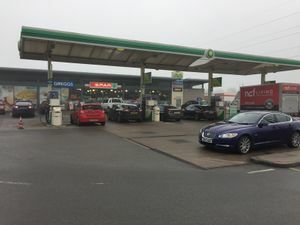 One of Euro Garages' first examples of what modern filling stations are beginning to look like, this service area opened in 2011 and features several small buildings with various outlets, and a pub and hotel next door. First two hours free for all vehicles, after which cars must pay £8 and HGVs, coaches and commercial vehicles must pay £14.99, or £19.99 to include a meal voucher. Prices are paid in the shop. The fees are strictly enforced by Parking Eye. The approach to the services. As you head eastbound, one mile before the site at the previous roundabout, Euro Garages operate an Esso filling station with a Spar store and Subway sandwich shop, and there is also a McDonald's and a separate Spar store, all around the colloquially named 'McDonald's Roundabout'. Euro Garages have advertisement boards located around the Esso station advising potential customers to travel on and use the Starbucks drive thru at this site. 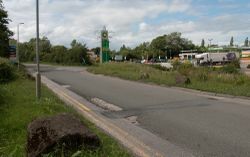 It's possible that this service area will need to close, if the Derby Road Roundabout upgrade scheme is carried forward.